A successful workshop was held Thursday 24th May 2018. There are three significant updates to announce for the MERRByS service. The TDS-1 mission ended and since February 2018 it has been operating with a mission extension. The SGR-ReSI is now running 7/7 days, rather than the 2/8 as in the first 3 years. This is increasing the coverage and sampling by a factor of 4. To support continuous operations the DDMs are now selected onboard to only those with antenna gain > 0dB, and compressed using a variable quantisation rate. We are not expecting users to see differences from this compression process. Further details are available on request and will be put in the Product Manual in due course. The L1b version has been increased to V0.71 to support the compression. The 2nd announcement is that MERRByS is now being updated every 6 hours with new data to the FTP server. There are two streams of data available. The 3rd announcement is that the L2_CBRE (Calibrated Bistatic Radar Equation) V0.5 Algorithm has been incorporated into MERRByS. 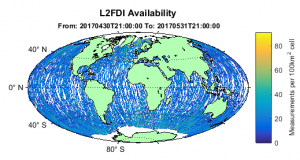 The National Oceanography Centre (NOC) have developed this algorithm to use additional receiver and transmitter corrections to improves the wind-speed measurement. This is the algorithm as presented in GNSS+R 2017, incorporated into MERRByS. It should be noted that this is currently preliminary work and is expected to be updated soon with a new version. Currently the coverage is sparse due to a known flagging issue. We will currently be putting the CBRE and FDI ocean wind speed products alongside each other. The focus for GNSS-Reflectometry with the SGR-ReSI is to measure geophysical parameters such as ocean wind-speed and mean-squared-slope. This is performed by receiving the GPS navigation signals reflected from the Earth, measuring the power and signal distortion caused by the reflection then inferring back the parameters of the surface. One of the factors that affect the reflection power measurement is the power level transmitted by each of the GNSS satellites. There is variation between each GPS transmitter and over their antenna patterns. The SGR-ReSI uses the signals directly from the GPS transmitters for navigation and for the steering of the DDM processing to the location of the reflection. The power of the direct signals is measured onboard with a similar setup to that used for the reflections. With the last update to MERRByS the direct signal power measurements were exported to NetCDF file and released. These contain the time-series of our direct signal power measurments. The DirectSignalPower.nc files have now been replaced on MERRByS with version 0.3. Additional fields have been added and a number of corrections to the fields, so that now radiometric calibration can be performed on the data. The Direct Signal Power file is in NetCDF format and contains self documenting headers that can be inspected from the file itself. There are some minor updates in a new version of the MERRByS Product Manual V4. 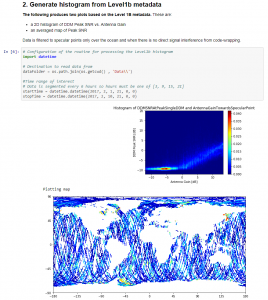 Example code has been added to show how to access the MERRByS data using a Jupyter notebook with Python. In addition to the Product Manual and the Matlab examples, this should provide an easier route for people to get started with the MERRByS data. 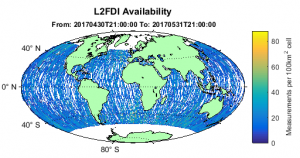 The Level 2 FDI wind-speed data has been updated to include measurements at high and low latitudes. The processing remains FDI V1.11. Originally a filter of 55 degree latitude was used to be sure that sea ice was excluded from the retrieval. The new approach filters using a sea-ice map so that our measurements continue closer to the Arctic and Antarctic. The new data format moves on from the XML / Tiff format that was used on the last release (Level 1B version 0.5). The new format is NetCDF and provides many advantages for distribution and processing. There is an updated Product Manual in Documentation. All the old data will still be available on the FTP server at /DataV0p5 for the time-being. On the 10th of July TechDemoSat-1 comes to the end of its mission. It was launched on the 8th July 2014 for a three year mission and has been a huge success. For those that aren’t aware , TDS-1 was built on a very tight schedule with an incredibly low budget. TDS-1 was built in around 2.5 years and in that time supported between 8-11 different payloads from industry (often changing!) at any one point. After all that , TDS continues to operate in Orbit. It should also be noted that TDS had only a heritage primary string and relied entirely on SSTL’s new developments and innovations for its redundancy as well as in some key primary roles. As of the 10th July 2017, all payload and SSTL PD operations will be ceasing now as the mission ends after its 3 year life and the craft will be placed ‘on ice’ in Orbit. During this time, nothing will run on the craft and it will just be monitored by the SSTL Ops teams and kept safe whilst arrangements are made for either the de-orbit or repurpose of the craft. At this point SSTL will NOT yet be deploying the de-orbit sail as there is possibility that if funding can be secured the craft may be used further. The flight of our SGR-ReSI has proven a new remote sensing technique, GNSS Reflectometry which is able to measure winds over the ocean to around 2 m/s, as well as sensing ice and land reflections. This experiment also has enabled the NASA CYGNSS mission – right now there are eight 25 kg microsatellites orbiting the Earth each with SSTL’s SGR-ReSI and waiting for the next hurricane to measure. TDS-1 has firmly established GNSS-R as a new earth observation technique. We are aware of 27 journal papers that are using TDS-1 GNSS-R data. There are certainly more on the way. 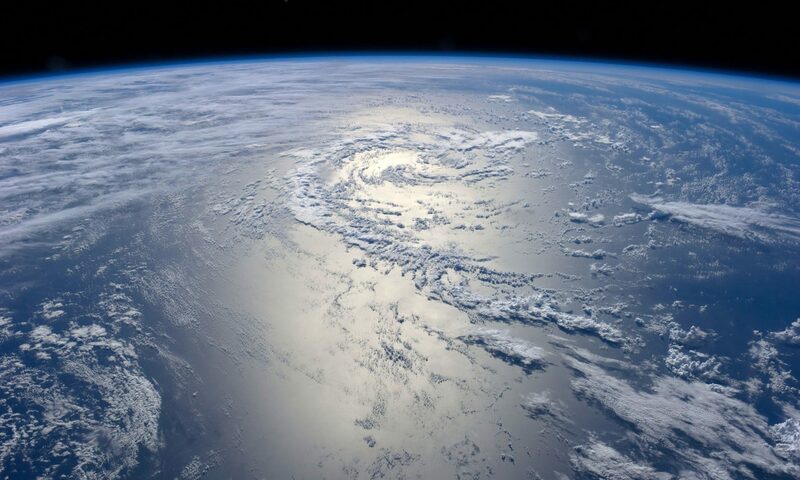 We are currently looking for ways of extending the TDS-1 mission to allow further operations of the SGR-ReSI, to continue providing data on MERRByS, developing a sea state / weather monitoring service and with a view to flying more such instruments. This is the first release of operations in Programmable Gain Mode.